The Change Machine: Featuring The 21 Days to Change... Your Mind with The Interventionist Jeffrey Miller! Through Strategic Intervention, NLP, and Hypno Therapy, Jeffrey will Guide You through to a Place of Understanding that which You want to Change. 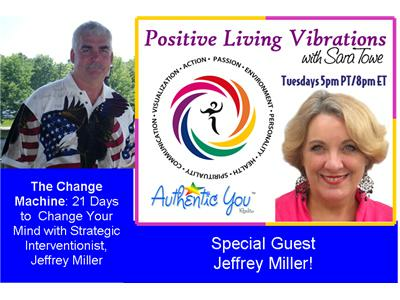 Don't miss this transformational episode! Be sure to call in toll-free to ask questions and share comments live on air: 1-877-296-0345.